One of the most confusing terms that new vegetable gardeners come across is ‘bolting’. Also known as ‘running to seed’ this is where a plant suddenly, often in a matter of a few days, starts to grow flower stems, simultaneously stopping all useful growth of the vegetable itself. It is not just a problem for people new to growing edible plants – experienced gardeners also have to manage this problem as I found out last week when several salad plants I have been carefully over-wintering in my greenhouse suddenly shot up central stems. Once the flower shoots form not only is growth slowed as the plants put all their energy into reproducing but they can rapidly become unusable in the kitchen as well. Lettuce, for example, becomes bitter tasting and the leaves are less tender once the plant has bolted. So what can be done to prevent it? The first step towards managing this problem is to understand what causes it. We need to realise that to some extent gardening is all about working against nature’s natural tendencies. The whole life-cycle of salad crops like lettuce is geared to lead up to the production of seeds in order to perpetuate the species. Running to seed, or bolting, is a natural part of this life cycle. Ending up on a plate is not! The gardeners job, therefore, is to persuade the plant to put off flowering for as long as possible so that a good leafy crop can be obtained. Brassicas such as cabbages, radish, turnip, rocket (arugula), pak choi etc. Some biennial crops, such as onion, leeks, carrots (and beetroot mentioned above). These crops are less susceptible to this problem, since we harvest them in the first year and they would normally only go on and produce seed in the second year. However, early bolting can be triggered by abnormal weather conditions or by leaving them in the ground over winter followed by a mild spring. Although we usually think of bolting as being caused by a sudden warm spell, such as my salad experienced last week, for many plants (particularly biennials) the trigger is actually the cold weather they experienced much earlier on. This ‘primes’ the plants to produce flower stems as soon as the weather warms up. The other important factor which affects many annuals is significant increases in day length. These extra light-hours trigger the plant to run to seed as summer approaches. For annuals, the key is to not stress the plant. Poor growing conditions such as dry soil or lack of nutrients from compost do not help, so it is good to mix in some quality compost and keep the soil relatively moist. If a cold spell occurs, then some protection will be beneficial, such as covering with horticultural fleece or moving them inside a cold frame if they are still in pots. For other plants, selecting varieties which are known to resist bolting is the best option. A well-known example of this is ‘Boltardy’ beetroot and I have certainly never had this run to seed whenever I have grown it. Some plants just don’t do well sown in spring. Many salad brassicas fall into this category: Chinese cabbage (pak choi), mizuna and rocket (arugula) are good examples which are all best sown in mid to late summer. Lettuces can be kept from bolting by regularly picking the outer leaves, keeping them from maturing properly. This ‘cut and come again’ approach to harvesting can extend the time they produce for up to 10 weeks. The most general advice, applicable across the board, is to make regular sowings of plants. Weather is by very nature always unpredictable, so sowing a few plants every two weeks or so will guarantee that some of them should do well, whilst still giving you some early harvests before they bolt. "Have you experimented with sowing seed "by moon cycle" i.e. sowing lettuce seed when the moon is on the make?" "Doug, I haven't experimented with moon cycle planting myself but I have friends who have and think there is something to it. Do you think it helps prevent bolting?" "I have been having trouble for the last several years with Lettuce. I have tried several different ways to sow, and it always just comes up here and there. I have also bought seed from differnt places, wondering if someone was selling old seed. What is the best way to sow lettuce, I like the loose leaf type." "Lou, personally I sow loose-leaf lettuce seed in small trays of potting soil on my windowsill and let it germinate and grow to about one inch high before transplanting it. I ease out a little lettuce plant with a teaspoon to keep the root system intact with as much soil as possible and transfer it to big pots. You can read some of the details in this GrowBlog article: http://www.growveg.com/growblogpost.aspx?id=35. Good luck with it!" "I have greens in the green house over the winter and some of the lettuce has bolted, my rabbits still love it. I just plant more. The GH is kept around 60 but some days it will get up to 80 What I do is plant more, hope this helps, I in zone 6b Frankfort, KY "
"Great article! I learned something new :)"
"My pak choi is bolting! Can I stop it and save the plant by pinching off the flower buds?" "I live in Ohio and plant my onions early .but still most of them bolt on me.What am I doing wrong?" "Melanie, once your Pak Choi is bolting you can try to slow it down by pinching off flower buds but it won't fully recover. I recommend getting another batch sown. 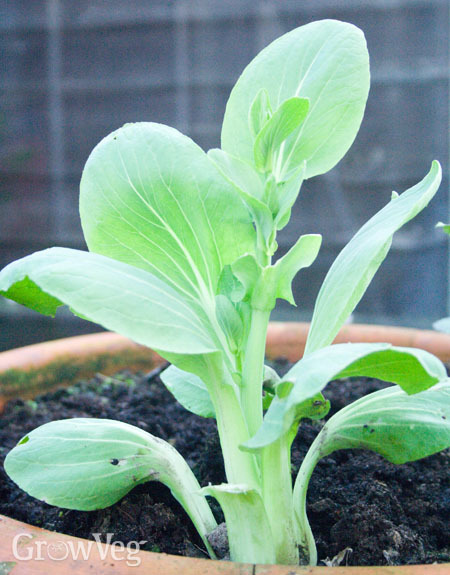 In my experience Pak Choi is much less likely to bolt later on in the year when days are getting shorter." "Patricia, bolting onions can be caused by several factors - cool weather followed by a hot spell, loose soil around the onion roots or irregular watering/rainfall. One thing worth trying is to buy more expensive 'heat treated' onion sets which are much less likely to bolt." "My paternal grandfather, a professional grower, planted his onion seed on the shortest day and pulled them on the longest day ..... but that was 70+ years ago! " "My lettuce is bolting! Can't i just cut the main flower stem?" "While lettuce becomes bitter once it bolts, you can cut the stalk off of beets and chard and it will continue to produce tasty leaves. These plants both develop big roots which will over winter in mild climates." "Hi, My original question was I used the wrong fertilizer 13-0-46, and was suppose to use 20-20-20. Now my lettuce outer leaves are starting to lay down (not die though), and core is starting to bolt/flower. Is there any way to fix this in my smaller plantings? I got an explanation from another yahoo which matches what is happening to me, but looking for clarification: User wrote: "N-P-K is the 3 numbers of fertilizer. N-Nitrogen-shoots (green parts of plant). P-Potassium-roots. K-Phosphorus-Flowers. Since your K was 46 for flowers, I believe your lettuce is going to BOLT. Bolting means it is going to flower and go to seed. So the leaves are laying back for the stem to grow and flowers and seeds are going to be made." This is exactly what is happening to my crop, but I think the community member mixed up the P-K explanation though. When I looked up N-P-K: N for Nitrate, P is for Phosphorus, and K is Potassium. Can someone confirm if Phosphorus is for the roots, and Potassium is for flowers? Also, is there a fix for this while my plants are still very young? If it is overdose of Potassium, is there something I can do so my lettuce plants won't bolt? Thanks in advance"
"My cabbage bolted can I now take some kind of seed or cutting to start again?" "Two answers here - years ago I read the native American Indians use to plant plants that grow above the ground 3 days before the full moon and root plants 3 days after the moon. The story said you would produce the best crop doing this. Since then I have always noticed how plants really grow around the full moon time. The other answer here is you only need an NPK of about 10-12% N. I use 12.6 N 5.2 P 14 K."
"Can I take the bolted part of the cabbage and plant it again or do I have to throw it all out now. "